The Boston University field hockey team had a busy weekend, facing Patriot League opponent College of the Holy Cross Friday night and the University of Massachusetts–Amherst Sunday afternoon. The Terriers (8-7, 3-1 Patriot League) put on an impressive show Friday night at New Balance Field, beating the Crusaders (3-13, 0-5 Patriot League) in an overwhelming 4-0 victory. Throughout the game, the team exhibited an aggressive offensive style of play, while mostly playing in the Crusaders’ end of the field. It only took until the 21st minute for sophomore midfielder Hester van der Laan to open the scoring with a redirect goal assisted by junior midfielder/forward Sofi Laurito. Sophomore forward Taylor Blood added to the scoreboard in both the 23rd minute and the 38th minute, giving the Terriers a 3-0 lead. 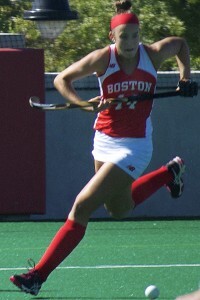 Laurito would cap BU’s scoring in the 55th minute, allowing BU to finish the game 4-0. On Sunday afternoon, however, the outcome of the game was not as favorable for the Terriers. In the non-conference matchup against UMass (8-8), the Terriers fell 2-1 in overtime. In the first half, the Minutewomen opened the scoring off their only penalty corner of the first half, with freshman Melanie Kreusch accounting for the goal. Despite outshooting the Minutewomen by a 4-1 margin and having more corner opportunities, the Terriers were unable to score in the first half. The Terriers defended well in the second half, with senior goalkeeper Valentina Cerda Eimbcke saving all four shots she faced. After back-to-back corner opportunities, sophomore forward Amanda Cassera tied the game in the 44th minute during a penalty stroke – her team-leading eighth goal of the season. Eimbcke was able to keep the Terriers in the game with two incredible saves, but BU was unable to capitalize during its final three corner opportunities toward the end of the second half, sending the game to overtime. In the 82nd minute, Minutewoman fullback Lauren Allymohamad scored the winning goal in a redirect from Kreusch to give UMass the dramatic victory.